Some great fish were weighed in, including an impressive Sampson fish from Grand Master Eddie Skerry. Ed has been consistently involved with the sport since the 1960’s and still loving every minute of it. And Ryan Schulter got eye ball to eye ball with a large Marlin that came in close to check out the competition, unfortunately Ryan had just depowered his gun for a Red Rockies. He was heard muttering a red rockie marlin>>@! throughout the night. Young Daniel Gaunt from the Workers weighed in a small Cobia shot from under a ray, that’s some good shooting. Olly had the big show bag for the day, an impressive 18 species and was the man to beat on Day 2. Day 2 was a rerun of day 1, perfect conditions in paradise. And of course what worked the first day doesn’t always work on day 2. Highlight of the day was picking up young Hayden Montgomery who had landed a Marlin in 3 meters of water, tucked away in a cosy corner. We were leaving when we heard some pretty serious screaming, we motored over, expecting to find a junior bailed up by a Nurse having ‘takeaways” – no, it was Hayden with a grin from ear to ear hanging on to the bill of a Black Marlin. Later that day at weigh in in his excitement to have his Marlin weighed he left a bag of his fish in the boat. Despite this he still managed to place 4th in the Junior and 15th overall, as well as winning the DiveR Blades for the committee’s prize of best fish. A good selection of fish including Taylor, Whiting, Sambos, Flathead and an odd king were presented at the weigh in. Special thanks to Peter Gaunt for his heroic effort feeding the masses cooking more sausages than was humanly possible. Laid end to end they stretched from Sydney to Ulladulla. And when you have a big crew of hungry Junior’s and a few heavy weights mixed in there made sure no sausages went uneaten. Special mention to Joey Hodge and young Conner Elliott who did a tremendous job doing the scores. All grades from Sub Juniors to Grand Masters were fiercely contested with the top 10 having juniors through to Masters represented. Wazza was the outright winner, just nudging out Olly and winning by the slimmest of margins. The Workers took out the Masters and the Veterans, Mario and Olly respectively, Garth Byron second in seniors and Billy Biletic third in Intermediates despite only fishing 1 day due to illness. Christian third in Sub Juniors. Josh Green took the Juniors and third place outright, ) beating his 2 younger brothers and Dad) with fellow Neptune Zane Hutchinson 2nd and Max Carey 3rd. The Neptune’s haven’t lost their touch in producing lots of great Juniors. 16 Junior competed and this is the best field of Juniors in a long time and can only be good for the sport .A great turn out from the Neptunes, with the Green Party, the Cookies (That crew fills a land cruiser completely) and the Carey Trifecta. Father son and Grandfather fishing out of the 1 boat. The Sea Lions were well represented with Alby, Joe and a gaggle of Juniors lead by the young Hayden Montgomery, legendary Marlin whisperer. Thanks for making the effort of coming down and helping make the weekend such a success. And a big thanks to our Sponsors Ray Powell of DiveR Australia, Agro Dive, Adreno and others for their continuing support. 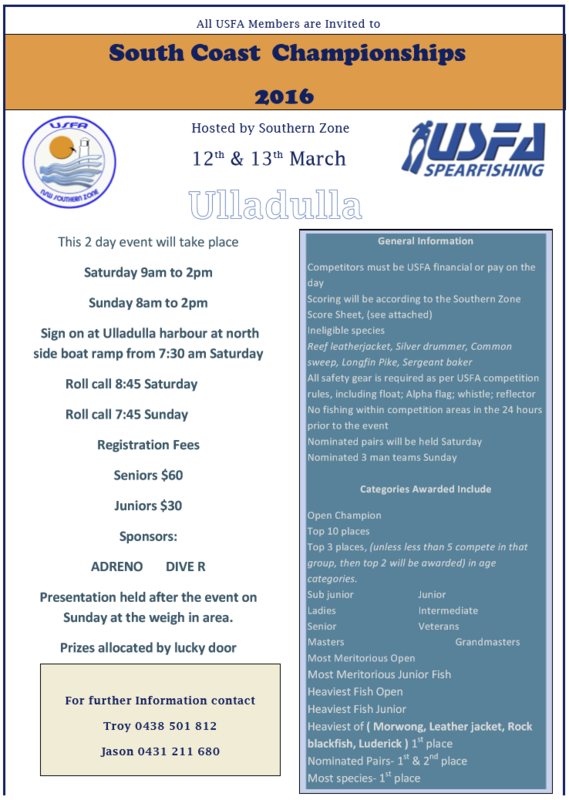 Next comp is on the 23rd April Saturday of the ANZAC weekend at Narooma. This is Autumn diving at its best and you would be disappointed if you missed it. Spectacular diving in pristine conditions, stunning country side and the last blast of warm weather diving before winter sets in. Great prizes even and better company - see you there.